Who is feeding these people? That trek is going to take weeks across all kinds of terrain. I'm sure there's not a McDonald's or KFC every few miles. You can't carry enough food to make it that far, much less water. Somebody is feeding and watering this mass movement. 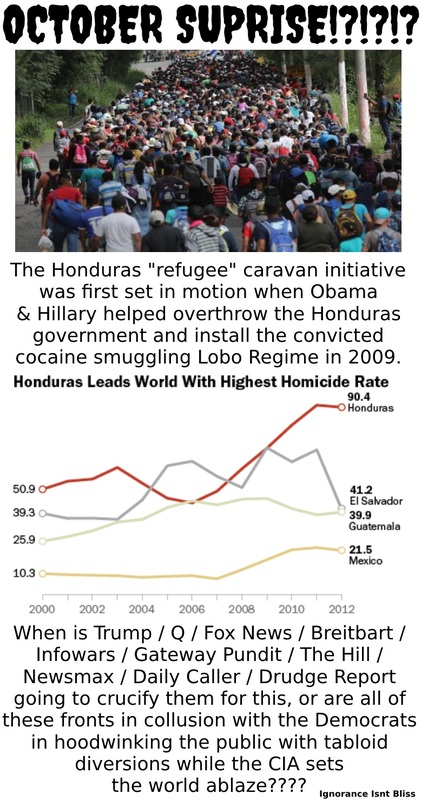 It will become apparent if / when this caravan somehow walks hundreds of miles to the border right before November 6th. There is absolutely no way to walk that distance in that period of time. The total driving distance from Guatemala to Texas is 1,633 miles or 2 628 kilometers. If someone marched 20 miles a day it would take 82 days at that pace and I don't see that happening so if it suddenly does... you know the deal. Why exactly are they all now "fleeing" en masse?? Was there any major event or is this orchestrated? If they will get in I will get on a plane and once in USA I'll say # it let me in coz who needs visas nowdays. When it becomes violent. And it likely will. And the left-wing socialist Mexican Government starts shooting these invaders, how many low-iq leftists in the United States will blame President Trump? Oh that’s right, 100% of them. “Now you HAVE to open our borders!” Will be the ‘intellectuals’ cry. Trump said they are not coming in. Not sure how he will do it (it he does). People need to be shown this tactic cannot work. Quick someone fly me down with my pepperball Gatling gun we’ll get this sorted right out. If they are being fed by a organized group along the way. The logistics would be a nightmare. To ease that burden they would probably need to stick to the same meal throughout the entire march. So my guess would be that everyday is Taco Tuesday . I saw a news story about there being a string of towns where volunteers are making up huge pots of stew etc to feed them. All part of the organized network that's been set up. Which was all initiated in 2009 and the MSM is keeping us all staring at the facade while covering up what the GOP should be crucifying them for, but they are not because its all a effing game and we're the marks.